Prime Minister Narendra Modi during the road show on March 4, 2017 in eastern Utta Pradesh. Hindustan Times/Press Association. All rights reserved. The Hindu nationalists led by the ruling BJP propagate a politicised version of this ancient faith, calling it “Hindutva”. Hinduism gets diminished when distorted and used to polarise society and create vote banks. The cry of “faith is bigger than the Constitution” sounds the death knell of democracy. The abuse of faith for political purposes is prevalent in democracies such as the US, Brazil and Israel. The talk of religious reforms provokes violent reaction. Rituals have got more popular as their emotional appeal has increased. Increased literacy has not weakened the hold of superstitions. The influence of the reformist Arya Samaj has declined. The nexus of politics and religion has resulted in the proliferation of so-called Ashrams. Assured of official protection in lieu of their power to deliver votes, several charlatans established institutions that attract devotees in large numbers. Some Ashram founders have been jailed following criminal complaints. Consequently, the words such as Ashram and Guru have been devalued. 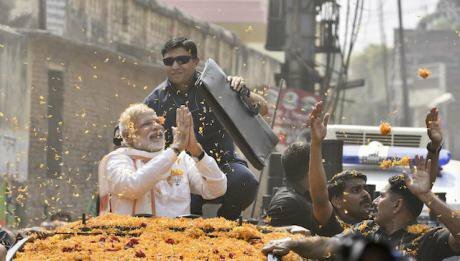 Narendra Modi's 2017 road show offered prayers at two historic temples and paid tributes to Hindutva ideologue Pandit Madan Mohan Malviya. Hindustan Times/Press Association. All rights reserved.However, in the narrow context of a caste system, politics – like railway travel – also has a positive influence on Hinduism. It has lessened the hold of the upper castes and empowered the depressed castes. This corrective impact on Hinduism can be attributed to democracy, the game of numbers. 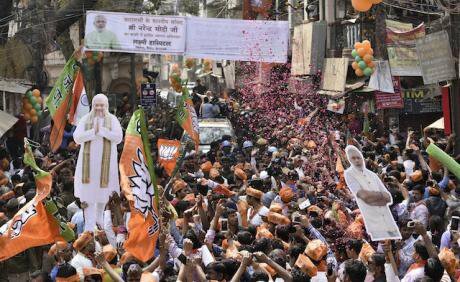 Even the BJP, mainly a party of the upper castes, has been forced to be a bit more inclusive to woo the Dalit voters in order to expand its footprint. The upper castes, with their limited voting power, are unable to retain their dominance. The depressed castes, made aware of their leverage during elections, learn to protest. This is a welcome development even if the process is conflict-ridden. The religious right-wing would like Hinduism to imitate Islam, a religion of the Book. It wants Hinduism to have a central creed so that Hindus claim that theirs is the only valid view. A BJP minister wanted the Bhagavad-Gita to be given an official national status. In this sacred book, Lord Krishna gives Arjuna a list of 35 qualities of a devotee. It defines the devotee as one who hates no creature and is friendly and compassionate. Since Atman (Eternal Self) within us is in all beings, to hate another is to hate our self. Tell this to a hate-mongering politician and he will say his party is not a charitable organisation! Obviously, the sacred book was needed just to show off the Government’s commitment to Hindutva. The proposal just fizzled out! To hate another is to hate our self. Tell this to a hate-mongering politician and he will say his party is not a charitable organisation!